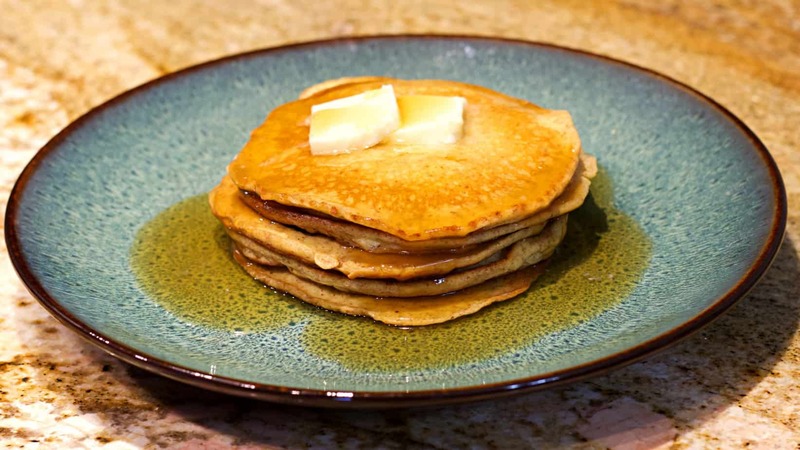 There are almost countless ways that you could make low-carb and keto-friendly pancakes, and this is one of our favorite Keto Pancake recipes that even our kids enjoy. Best part too is that they are really filling, so this recipe can happily feed a family of four. You can always mess around with the recipe to get the thickness of batter that you prefer, as some people like to have their pancakes thin like crepes and other people like their’s nice and fluffy. This can be prepared virtually any way. For starters, this is a protein-packed meal in and of itself. If you are looking to cook this for two people only you can simply divide the ingredients in half, and all other instructions would remain the same. One of the “tricks” to making this recipe is to make sure that your cream cheese is softened on the counter beforehand. Don’t use pre-whipped cream cheese to try to bypass this step, as the measurements would be completely off and so might the overall texture of the finished product. Just buy the regular 8oz bricks of cream cheese for this recipe. We have kids at home that are picky eaters, and they tend to not like things that they consider to be “diet” food, but this is one of those recipes that the kids clean up their plates every time. Sure, they get to put pure maple syrup on theirs while we don’t but they don’t complain at all about how these are different than the normal pancakes they were previously used to. We find more and more that our kids are getting used to eating this way when they are at home. Place the Softened Cream Cheese into a large mixing bowl, or a Food Processor if you want it to be even easier! Pour the Vanilla Extract on top (Pure Vanilla Extract is best, but you can use Imitation Vanilla Flavor if you have that handy). Crack the 6 Large Eggs on top of the Cream Cheese. Blend by hand, or with a hand mixer or stand mixer if you prefer. After blending the wet and softened ingredients together, slowly add in the Almond Flour as you continue to mix. If you notice the mixture getting thick enough to your liking you don’t have to add all of the almond flour. If it’s not thick enough, just slowly add a little more almond flour while continuing to mix. Heat a Large Skillet up to about 290* and add enough Butter to coat the bottom of the pan. Once the butter has been melted and begins to bubble a little slowly pour in the pancake mixture to create the size pancakes that you prefer. Cook for about 2 minutes on each side, but be careful not to over-cook them. Plate them and smother with butter, or topping of your choice. Optional: You can experiment with adding different flavoring extracts or spices to the mix to make them taste the way you like. Sometimes we add cinnamon or pumpkin spice mix for a seasonal flavor, other times we may add Maple Extract for a little old fashioned flavor. or you can cook , freeze and just warm up to eat. Can you use coconut flour instead? I’m not a big fan of the almond flour texture. Yeah, just use less of it. I use Trim Healthy Mama Baking Blend. Really good! Could these be adapted to make waffles? If so, how to do so? Absolutely. Usually to turn pancakes into waffles you just add oil to the pancake mix. Some people also recommend Xanthum Gum to help them rise. How much oil and xanthym gum? My daughter is allergic to all nuts. Is there any other flour that can be substituted? That has carbohydrates in it when I looked at the nutrition facts in store. Ok. I can see using Monk Fruit Syrup. But the Waldon Farms singer-free syrup in the recipe has sucrolose in it. From what I’ve read about Keto, anything with “ose” at the end of the name is a no-no on the Keto diet. It does have small amounts in it. Some people will have to order the Lakanto Monkfruit Syrup online, and Walden Farms is more common in the stores. ChocZero’s Maple Syrup. Sugar free, Low Carb, Sugar Alcohol free, Gluten Free, No preservatives, Non-GMO. Dessert and Breakfast Topping Syrup. SUCRALOSE, is an accepted Keto sweenter. SUCROSE IS NOT. They are totally different. 2-4 tbs of grass-fed butter (you can use regular, but I found grassfed is the best for this especially because it’s richer and has a lot more flavor), a splash or two of Maple Extract, a little splash of vanilla and a couple drops of Stevia. Mmmmm soo good. How many does it make?? At the top of the nutrition chart it says “4 servings per container”? And since it says a serving is 3 pancakes, does that mean this recipe makes 12 pancakes?? I measure them each out with a 1/4 Cup measuring cup and pour them that way. I see that the nutrition facts are for a serving of 3 pancakes. Can you please specify how big the pancakes are or how much batter you used per pancake to get a better idea of the cal, fat, carbs etc.? Each pancake uses 1/4 Cup of Batter each. That’s how I measure mine when I pour them. I love your recipes please keep sending some out. You don’t know how much this has changed my life. I started on a mission to make recipes that help keep myself and the rest of us motivated by keeping our tastebuds and our stomach happy! Thank you! I just found your website and I’m so happy! Your recipes sound great and yummy – plus I really appreciate your answering questions about substitutes, etc. I keep striving to stay low carb/keto eating and this will definitely help. Keep the recipes coming!! Thanks! I hope you can email lots of recipes!???? Have lost 90 lbs on Keto since Sep of 2017 and have another 60 If like to lose! I am extremely happy this far on this diet and I hope many of you out there are too or will find the same success as I have! All the best!!! I am new to the Keto cooking, but have been Lo-carb for years. Can you add fruit (berries) or nuts and stay on Keto with these. I am looking forward to adding more to our breakfast than simply bacon and eggs. The reason I ask about fruit is we really love blueberry pancakes and hope the berries are keto friendly. You can add nuts, and then some berries like Blueberries, Strawberries, or Raspberries in small quantities. Does your allergy of tree nuts also include Coconut Flour? do they taste like eggs? Can I substitute monk fruit sweetener instead of the pyure? If so, same amount? Thank you so much for your recipes, just starting this journey and I’m super excited to try several of your recipes! You can, but if you use a granular monkfruit like the Lakanto you would need to use twice as much since Pyure is twice as sweet as sugar. WOWWWWEEE. We made these and they were absolutely amazing! And they looked/cooked like real pancakes. 15/10 Will cook again!